And better gamers through life's lessons. Hello, if someone has an RSS feed that picked up that something new has happened. SURPRISE!!! I have a script written. The site is still broken, but it apparently works well enough to allow me to add new comics. So, while I'm waiting to get the site fixed, I'm going to start adding comics again. I'm not sure how regularly, I've got a script that's long enough to create a new story arch, about as long as the first published volume of the comic. Panel 01 - A long shot of Lakeridge City at Dusk. 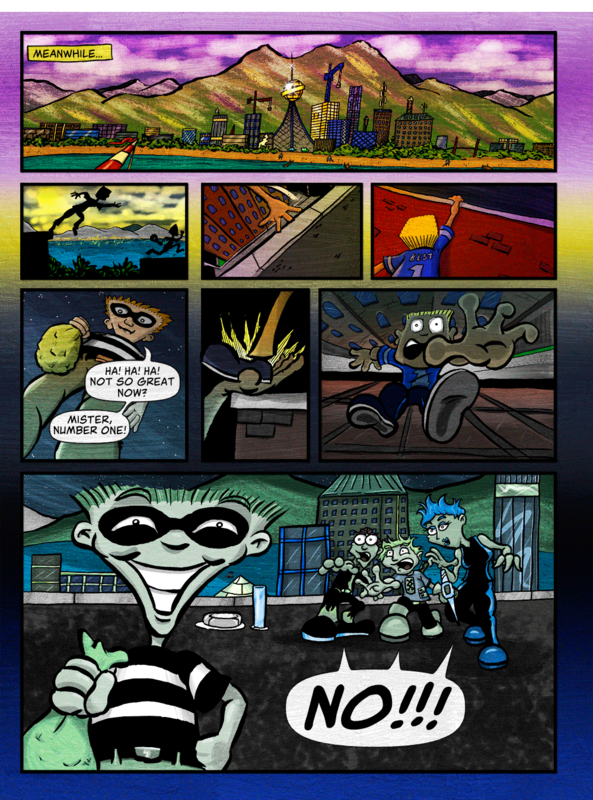 Panel 02 - THE BEST leaps from rooftop to rooftop chasing JEWEL THIEF. Panel 03 - The Best shorts the jump. Panel 04 - The Best manages to grab the edge and hold on with one hand. Panel 05 - Jewel Thief stand towering over the best. Ha! Ha! Ha! Not so great now? Panel 06 - Jewel Thief stomps on The Best's hand. Panel 07 - The Best tumbles backward to the streets below. Panel 08 - Jewel Thief grins beamingly to himself. COMBUSTION, PICK AXE, and CHILL arrive on the roof just in time to see The Best fall.